The chance encounter of a former Special Forces paratrooper and a shepherd’s son that alters the course of a life forever. Taj Mahal came into view, spotlessly white and clean after the night’s rain. Behind, the swollen Yamuna stretched languorously in the shape of a bow, each side disappear- ing into the distant haze. The architect had selected a perfect site. The river took a turn where it met the Taj, thereby reducing the wrath of a river in spate and ensuring that the monument would never get washed away. In front, sprawled the city of Agra. A chaotic mosaic of houses closely packed with no thought to any kind of town planning. Then the aircraft banked and like a kaleidoscope, the picture switched to green and yellow mustard fields dotted with clustered brown mud hovel villages, with ponds and tracks crisscrossing in a bizarre fashion. The pilot steadied the bird, as he flew into the wind for the drop. The Dispatcher leaned over and shouted into my ears. I forced a brave smile, giving him a thumbs-up. I glanced over my shoulder and saw the port stick get ready for the jump. Heavily laden men stuck to each other, right foot forward, both hands on the emergency chute, head well forward and shoulders round. The atmosphere was suddenly very tense. A tension built up by a body of men, in a confined space, all serious and focused on the same objective: to stay alive. The red light came on. The Dispatcher shouted, “Action Station!” The men poised, each mentally going through the emergency drills. The Sergeant cast a final glance at my static line, made a thumbs-up gesture and shouted something over the deafening din of the aircraft about exiting neatly. Then the green light blinked with that ominous croaking sound, which shuts off all other thoughts except to abandon the tense hell and get back to normal life. “Green on. go!” shouted the Dispatcher and gave a gentle tap on my shoulder. I lurched, steadied and jumped. I was airborne. The fall in slow motion, toppling, rolling and the image of other jumpers being ejected like pellets from a pea shooter, the jerk, the calm and I looked up at the reassuring silk above me. It was a perfect mushroom. I glanced around to ensure that no other paratrooper was threatening to jeopardize my peaceful flight by going through my rigging lines. Satisfied, I turned my attention to the next job of hitting terra firma in one piece. I must have been five hundred feet over the ground, when I noticed I was heading towards a white patch of land. Strange, I thought; it wasn’t there in the last jump. I was still trying to figure out the mystery when the white patch split into two. Perplexed, I watched as it broke into smaller squares and circles. “Sheep!” I cried out loud. There must have been hundreds of them. I could distinctly make out tents and the bakerwals (shepherds) standing outside. At two hundred feet I raised an infernal din. “Move you bloody sheep!” I bellowed, but none seemed to respond. They just stood there, mesmerized, with jaws hanging, gazing at me in silent bewilderment. I hit the ground like a sack of potatoes, crumbling into an undignified heap, fortunately with-out hurting self or animal. The sheep scattered in all directions, bleating and protesting against this intrusion from the sky. I got up with nonchalant dignity and ignoring the spectators, got busy with the rolling of the chute. There were five of them; the old man, a woman who I guessed was his wife, elder son, a daughter and a younger son about twelve years old. They were standing in a line in the same order of seniority, gaping at me as if still unsure about the spectacle they had just witnessed. Convinced that I was not a devil incarnate impersonating a paratrooper, the old patriarch mustered courage to address me. “How much money do you earn?” he asked. A straight question, I thought, deserves a straight answer. “Three thousand rupees per month,” I said. The entire family exchanged astonished looks at this. The massive turban, dress and patois marked them out as gujjar bakerwals from Rajasthan. And for a Gujjar, money is second to none, with his cattle and sheep following close behind. A whispered conference followed. The old man, I could see, was hesitating, while the daughter seemed to be goading him to say it. Wow! no written agreement or interviews, just a simple offer for employment. “What would be my job and how much will you pay,” I asked, without paying much attention to him. I was at an age when I could have possibly joined him for his daughter rather than the money he was offering. However to the old man, I just shook my head. Another exchange of looks followed between the family members. So that was the reason, I guessed. The job offer was purely on sympathetic grounds. The daughter, disappearing into the tent, now appeared carrying a hot glass of goat milk, topped with a generous helping of cream. I had no intention of accepting, however, hospitality expressed without having asked for it should never be refused. It’s bad manners, I thought. I accepted the tumbler big enough to hold a bottle of beer. With that, I wore my beret, gathered the chute on my shoulder and gave them a parting look. They were still standing in a line, impassive and absolutely unconvinced by my ideology to life, except for the little boy, whose brown face split into a big smile. Then coming to attention, he gave me a clumsy salute in farewell. I acknowledged it and trudged away. I left the Army and many years later, I was waiting for a southbound train at Delhi station when I saw a young man, wearing a maroon beret and khaki desert overalls, approaching me through the crowd. The air-borne swagger was prominent and with utter disdain (which most men in uniform have for their civilian counterparts), he was moving people out of his way. One look at his bearing, the cut of his face and the angle at which he wore his beret (low over the ears) a trained eye could immediately say that here was a good soldier. He walked up to me, came to attention and saluted. 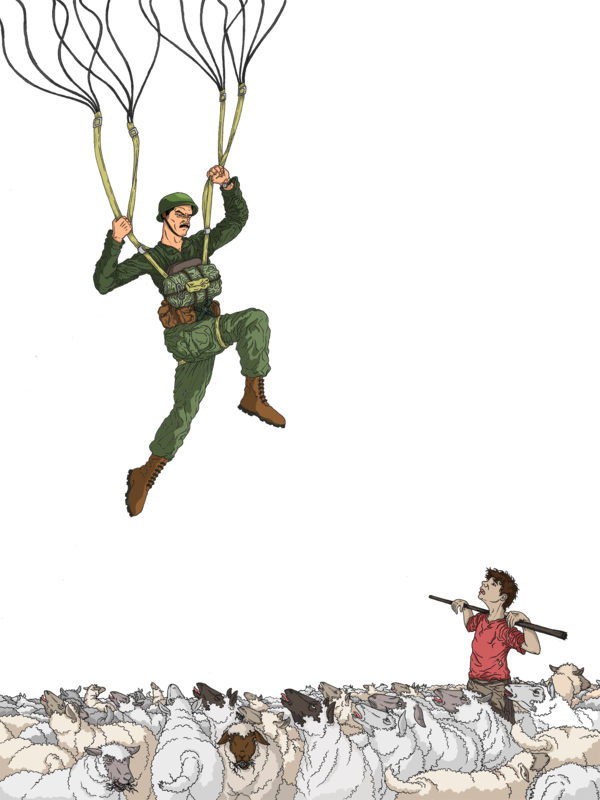 “Paratrooper Mangaram, Special Forces,” he said. I acknowledged his salute with a nod and extended my hand. “Have we met before Manga?” I asked. “Yes Sir,” he said, “Many years ago. As a young Lieutenant, you fell amongst my sheep. I was the little boy you gave those twenty rupees to. And I still remember your words, Sir. To be a man among men, you have to be different. So here I am Sir, wearing the same beret that you wear. In fact, I went a shade further and I joined the Special Forces. You are in the SF too, Sir, for I remember seeing the SF insignia on your overalls years ago”. “Yes,” I said in confusion, forgetting what I must have said. But a vivid picture of a smiling brown boy saluting came back. I patted his shoulder affectionately. He weighed the question briefly. “Oh yes,” I said, smiling, I did understand. The so-called glamour of the maroon beret is a far cry from the process of actually earning one, which requires guts and determination. It is not the colour that has the amazing effect on the wearer, but the blood, sweat and effort that goes into earning one. To cross the threshold where mind and body scream to stop, yet to be able to extract that last bit. Oh yes, there was more to the maroon beret than what met the eye. It was a symbol, an epitome encompassing an outlook, a whole attitude of a minority, who had the privilege of wearing it; never say die. Looking at him, I was reminded of my youth – the pride, arrogance, prowess and that awesome feeling of being young. “Where are you off to Manga?” I asked. My train had pulled in. I picked up my bag and patted his arm. With that, I got into the train without answering his question, for I didn’t have the heart to tell him that his childhood hero was a soldier no more. This story was part of the Borderlands section of The Outdoor Journal Spring 2015 edition of the print magazine.